Born: Edwin Hardy Amies in London, 17 July 1909. Education: Studied at Brentwood School to 1927. Career: School teacher, Antibes, 1927; office assistant, Bendorf, Germany, 1928-30; trainee, W. & T. Avery Ltd., Birmingham, England, 1930-34; managing designer, Lachasse, 1934, managing director, 1935-39; served in the British Army Intelligence Corps, 1939-45; lieutenant colonel; head of Special Forces Commission to Belgium, 1944; designed for Worth and for the British government Utility Scheme during the war; established own couture business, Hardy Amies Ltd., 1946; introduced ready-made line, 1950; dressmaker by appointment for HM Queen Elizabeth II, England, from 1955; added menswear, 1959; firm owned by Debenhams, 1973-81, repurchased by Amies, 1981; also designed menswear for Hepworths, from 1961; vice-chairman, 1954-56, and chairman, 1959-60, Incorporated Society of London Fashion Designers. Exhibitions: Court Couture 1992 , exhibition at Kensington Palace, London. Awards: Named Officier de l'Ordre de la Couronne, Belgium, 1946; Royal Warrant awarded, 1955; Harper's Bazaar award, 1962; Caswell-Massey International award, 1962, 1964, 1968; Ambassador Magazine award, 1964; the Sunday Times special award, London, 1965; Commander of the Royal Victorian Order, 1977; Personnalité de l'Année (Haute Couture), Paris, 1986; British Fashion Council Hall of Fame award, 1989; Knight Commander of the Victorian Order, 1989. Address: Hardy Amies Ltd., 14 Savile Row, London W1X 2JN, England. Just So Far, London, 1954. The ABC of Men's Fashion, London, 1964. The Englishman's Suit, London, 1994. "A Century of Fashion," in the RSA Journal (London), March 1989. "Hardy Country," in Vogue (London), March 1975. Boyd, Ann, "Hardy Amies, Haute Couturier," in The Observer (London), 3 February 1980. Hauptfuhrer, Fred, "Oh, Those Polka Dots! Oh, Those Bows! Hardy Amies Designs Queen Elizabeth's Clothes," in People, 8 October 1984. "Happy Birthday Mr. Amies," in Vogue (London), July 1989. Ginsburg, Madeleine, "Tailor-made," in Country Life (London), 13July 1989. Sir Hardy Amies, 1955: lamé suit with mink collar. Design by Sir Hardy Amies, ca. 1951. 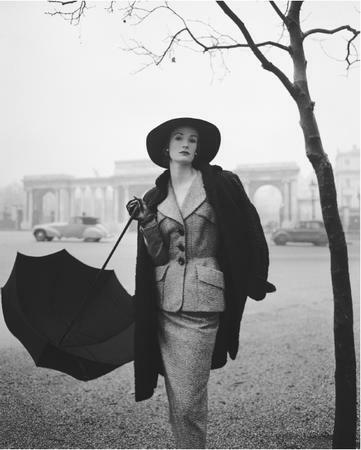 © Norman Parkinson Limited/Fiona Cowan/CORBIS. The Queen's Couturier in London and Gloucestershire," in Architectual Digest (Los Angeles), September 1989. "Hardy Perennial," in Fashion Weekly (London), 19 October 1989. "What's a Couturier to Do?" in Chicago Tribune, 21 May 1990. "Royal Attire on Exhibit in London Palace," in Chicago Tribune, 20 September 1992. "The Englishman's Suit," in the Economist (U.S.), 16 July 1994. Williams, Hugo, "The Englishman's Suit: A Personal View of its History, its Place in the World Today, its Future and the Accessories which Support It," in the Times Literary Supplement (TLS), 22 July 1994. Hardy Amies began his career as a couturier when he was brought in as managing designer at Lachasse, in London, after the departure in 1933 of Digby Morton. He acknowledges that by examining the models left by Morton he learned the construction of tailored suits. The 1930s was an auspicious time for the new generation of London couture houses emerging, for British tailored suit reigned supreme in America. 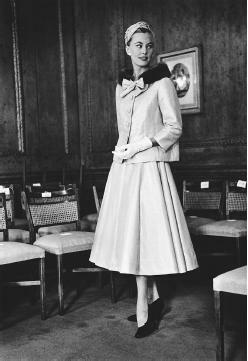 Amies' contribution to the construction of the tailored suit for women was to lower the waistline of the jacket, which he believed Morton had always set too high, thus giving the "total effect of a more important-looking suit." His fashion philosophy, that elegant clothes must have a low waistline, characterized his work ever since and his clothes have always been just above the hipline rather than on the natural waistline. Working on his theory that fashion design should be a process of "evolution rather than revolution," Amies has conceded that his duty as a designer was to vary the cut and design of the tailored suit to make it as feminine as possible, without departing from the canons of good tailoring. Like his counterparts in the London couture, Amies' work was always tempered by the requirements of the private couture customer who formed the majority of his business. Unlike the Paris couture houses who enjoyed the support of large textile firms and saw the link with couture as a beneficial form of publicity, as well as backing from the French Government for its industrie de luxe, the London couture houses did not benefit from such aid. The main role of the London couture, according to Amies, was not to create avant-garde clothes for publicity purposes but to design for the individual customer. Amies is perhaps best known for his work for Queen Elizabeth II for whom he began a long association as a royal dressmaker in 1950 when he made several outfits for the then Princess Elizabeth's royal tour to Canada. Although the couture side of the Hardy Amies business was traditionally its less financially successful area, it has nonetheless given his house a degree of respectability as a royal warrant holder. One of his best known creations is the gown he designed in 1977 for Queen Elizabeth's Silver Jubilee portrait which, he said, was "immortalized on a thousand biscuit tins." While Amies' royal patronage clearly enforced his international image, his menswear and related fashion spinoffs (such as licenses) were by far his most sucessful enterprise. His small leather goods, ties, knitwear, and shirts, produced and sold under licensing agreements in various countries including America, Canada, Australia, and Japan, made the Hardy Amies label a household name. Another side of Amies' work is in corporate uniform designing for the service industries, such as hotels and airlines, where his reputation both as a designer of tailored clothes and his royal association have undoubtedly made him an appealing choice. Amies weathered the transformation of London's fashion image as the home of the thoroughbred tailored suit to a veritable melting pot of creativity, during a career that spanned more than fifty years. And even after his retirement in 1994, he remained one of Britain's best known establishment designers. Though he has admitted "I'm absolutely astonished at my success," and downplayed his talent, everyone agrees Hardy Aimes has inimitable style.